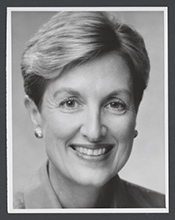 SHEPHERD, Karen, a Representative from Utah; born in Silver City, Grant County, N.Mex., July 5, 1940; B.A., University of Utah, 1962; M.A., Brigham Young University, 1963; staff assistant to Senator Frank E. Moss; teacher of high school and collegiate English, 1963-1975; director, Salt Lake County social services; founder and owner of a magazine and publishing company, 1978-1988; director of development and community relations, David Eccles School of Business, University of Utah, 1989-1992; Utah State senator, 1991-1993; elected as a Democrat to the One Hundred Third Congress (January 3, 1993-January 3, 1995); unsuccessful candidate for reelection to the One Hundred Fourth Congress; fellow at the Institute of Politics, John F. Kennedy School of Government, Harvard University. Karen Shepherd in Women in Congress, 1917-2006. Prepared under the direction of the Committee on House Administration by the Office of History & Preservation, U. S. House of Representatives. Washington: Government Printing Office, 2006.